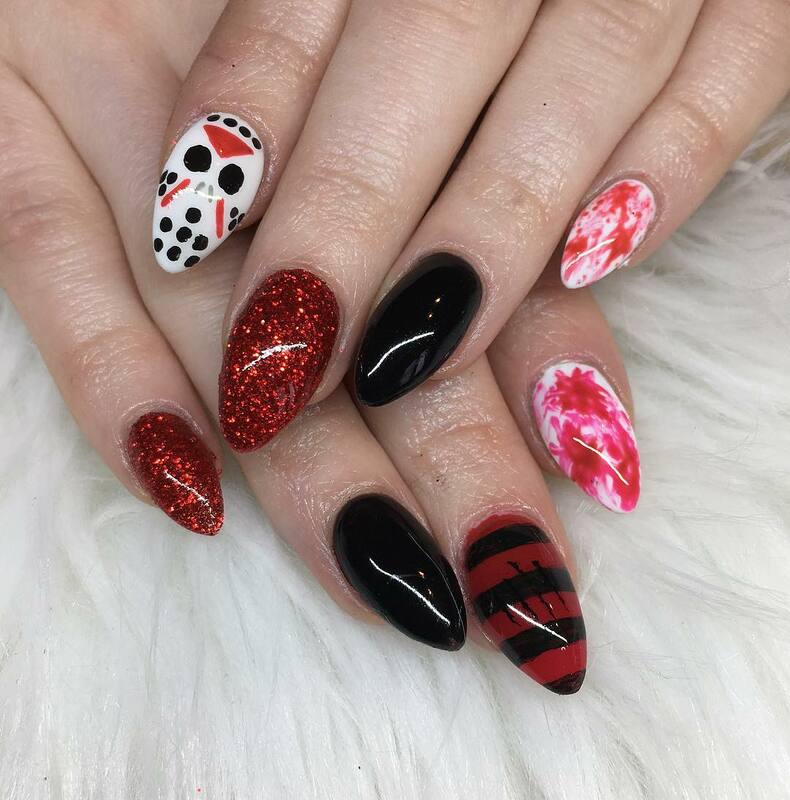 It’s not just the ORLY American heritage that get us excited for Halloween, it’s also the fangtastic nail art opportunities that this spooky holiday brings! We could spend all day looking at boo-tiful Halloween nail designs (but let’s be honest, that Halloween outfit needs serious thought too!) so we’ve put together a bite-sized look at some Halloween nail looks that are to die for! They’re all easier than you think so if you’re not a nail pro, don’t sweat it. 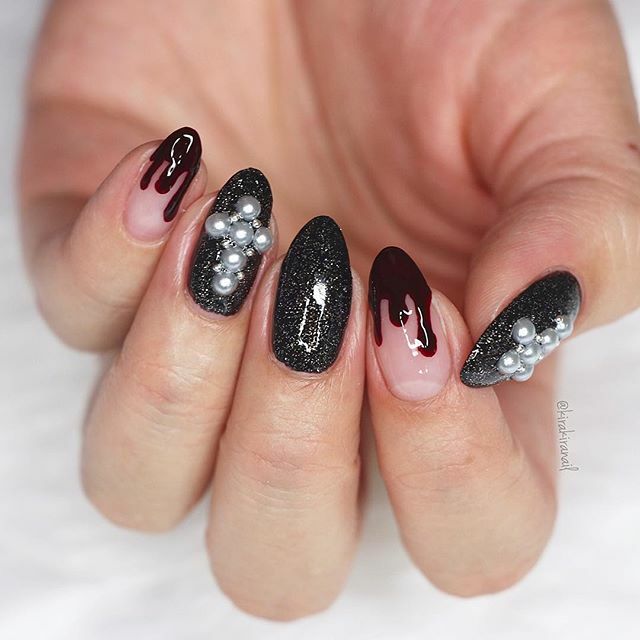 First off, we are obsessed with this simple (but creepy) Halloween look by @estheticsbytmr. Before you begin, use a base coat. We recommend the ORLY Bonder Base Coat. Let’s start with the blood splattered pinky: Use ORLY White Tips as a base, let dry and dip a straw into a little puddle of ORLY Monroe’s Red. Hover the straw over the nail and blow into the other end and splat! Use ORLY Liquid Vinyl to create your all black ring nail and let’s move on to the sparkle on that middle finger. We recommend ORLY Star Spangled to give you that Spooktacular shimmer. If you’re switching up and having a striped nail, use Monroe’s Red as a base and carefully paint your Liquid Vinyl in thick stripes – Top tip! Use sticky tape on a completely dry base to mark out your lines, or just use a thin brush and a steady hand. Finish with a few thin lines of Liquid Vinyl as scratches – use a cocktail stick dipped in polish if your brush isn’t thin enough. Finally, Freddy himself. Paint your index finger with White Tips. Then grab a dotting tool (a cocktail stick or bobby pin will do the job too!) and dip it into Liquid Vinyl. Carefully dot your mask holes onto the nail. Clean off your tool and dip it into Monroe’s Red for the red detailing. Finish with ORLY Mirror Mirror for the nose slits. Lock your art in with ORLY Polishield for a super shiny finish. How boo-tiful! This look, by @kirakiranail, is ideal if you don’t want super gory nails for the Halloween party. For your thumb, middle and ring finger start with a base of ORLY Bonder Base Coat. Paint two coats of Liquid Vinyl. Let dry and pop a coat of ORLY Tiara over the top. Lock in with your ORLY Polishield and when it’s dry, grab some nail glue and add your beads, gems or rhinestones in a cross pattern to your thumb and ring finger. Now for the bloody index and pinky! Once you’ve applied your base coat, use ORLY Rose Coloured Glasses for your natural pink colour. Spill out a little puddle of ORLY Ruby and grab a dotting tool or small brush. Start with the ends of your drips and create a little dot, then gently drag towards the free edge of your nail. Be careful to not use too much pressure, you don’t want to be dragging your beautiful Rose Coloured Glasses Base. Once you’ve defined your drips you can use the brush of your polish to paint the free edge. Finish with ORLY Polishield. 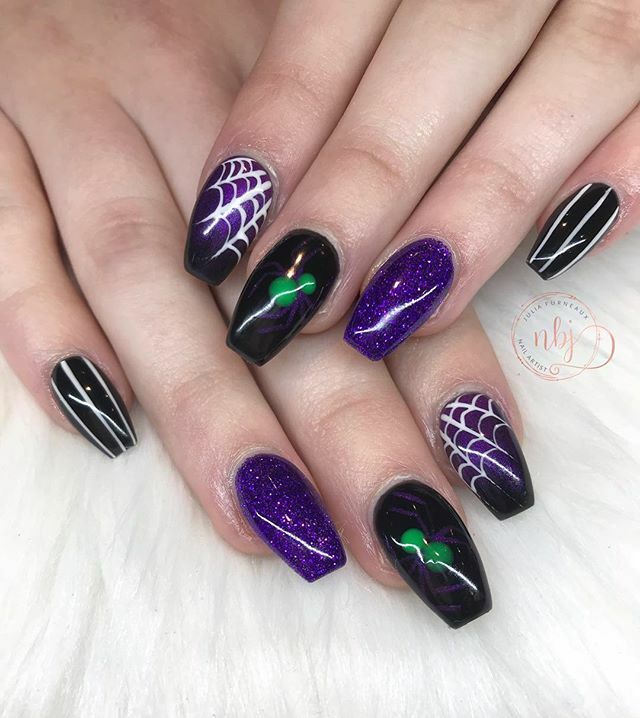 Let’s creep it real, nobody loves spiders but @nails.byju has created a nail design that has got us all reconsidering our Basic Cat costumes this Halloween and thinking about being spooky spiders. For all your nails except the ring finger, paint two coats of ORLY Liquid Vinyl. For your stripy pinky nail use ORLY White Tips and carefully paint thin lines vertically down the nail. Use a cocktail stick or tape to make your lines super thin and neat. For your spiders on the ring fingers, use a large dotting tool or bobby pin dipped in ORLY Hip & Outlandish. Add a big dot and a slightly smaller dot to your nail. Let dry and use a cocktail stick dipped into ORLY Bubbly Bombshell and paint out the spiders creepy legs. Your spider web index finger is simpler to create than you might think. Dip a makeup sponge in Bubbly Bombshell and sparingly dab onto the nail near to the cuticle. Once dry, use a cocktail stick or thin brush and White Tips to draw out four lines diagonally on the nail. Then paint small curved lines to finish the web. Paint your ring finger with Bubbly Bombshell. Lock in with ORLY Polishield, or why not try Matte Top Coat for a matte finish?